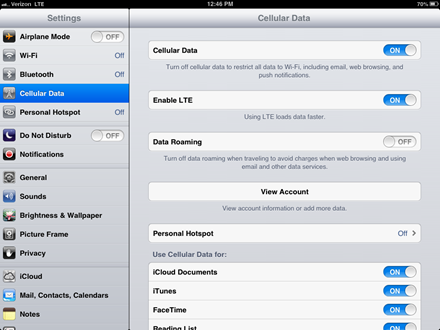 I’ve had an iPhone with WiFi + Cellular capabilities since 2008, and several iPads with cellular over the years as well. My iPad 3 now has no regular data plan on it, since I’m much more likely to grab my iPad mini when I’m out and about and away from guaranteed home WiFi. 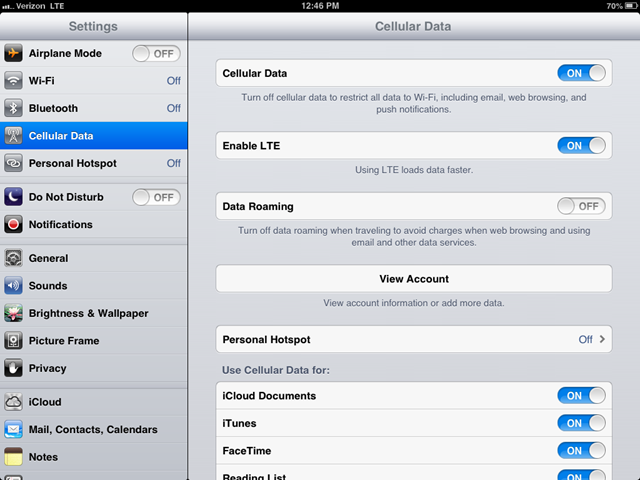 And I have to say now that cellular means LTE, it is becoming one of my favorite features on the iPad mini. 3G was always nice to have around for always-on connectivity, but I never found its speed anything to write home about. 4G and LTE is a completely different story – the speed is truly impressive. In fact, I find that in a number of public places LTE gives me much faster performance than the available free WiFi networks. It’s becoming my habit to turn off WiFi and choose LTE as my first option a lot of the time now – though I should mention that I’m using the iPad mini for almost entirely work related activities when doing so. I’m checking and replying to email, keeping up with news feeds, browsing the web, testing apps and taking notes for reviews, working on and publishing blog posts, and so on. I am not watching videos or streaming music or anything similar – so my data usage is still pretty low and well within my monthly 3GB plan. I’m fortunate that here in Austin 4G and LTE coverage for both AT&T and Verizon is superb – I can get it nearly everywhere within the city and it’s fast and reliable. My iPad 3 used an AT&T plan and my iPad mini is now using a Verizon plan and I’m very happy with it. What’s your experience with the iPad and LTE been like? Have your results been as good as mine?